will notice Acrylic Fabricated components all around you. Decorative with all kinds of colours and textures it is truly exquisite in appearance and highlights the object you are trying to promote. 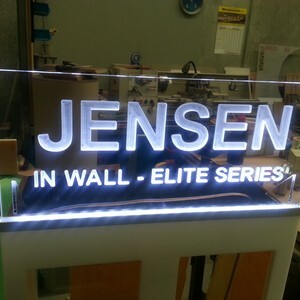 Many displays are now designed using acrylic fabrication techniques used by Plastic Fabrication Professionals who understand the characteristics of Acrylic and utilize them to create wondrous displays of modern art and signage. Architectural Designers with use of 3d cad software now let their imagination run wild with all types of stunning visual effects using Perspex and Acrylic to showcase their customers products. Using materials such as slumped acrylic which has a textured pattern on it, the visual aspect is awesome. Even a simple piece of 3mm thick black acrylic panel can transform a tabletop into looking like a designer bench. Many restaurants you may visit will have acrylic fabricated pieces in them just take a look and see how many you can spot. The advantages of acrylic is that it comes in many colours & thicknesses as well as being lightweight , it offers the ability to be bent cut glued machined and polished. You can even paint it and print on it. The applications are endless and are now seen as a cheaper alternative to glass offering cheap solutions to soundproofing and insulating your house. Many household kitchens now have acrylic fabricated cupboards and drawers as well as visually aesthetic splashbacks as well as alfresco barbecue designed with modern looking acrylic cupboards. The options are limitless only by your imagination, so if you need to create stunning visual acrylic fabricated displays why not give your local plastic fabrication expert a call and they will be only too happy to discuss your project with you.